On the Road to Damascus: Joy be with you. The mood was sober. The air hung heavy and still. The people gathered together were straight faced, tight lipped, and void of emotion. Every word and gesture seemed labored as if bearing a heavy weight. People seemed to be going through the motions with little thought or care. There was rarely a smile and I often caught looks of distress on some faces as the little children among us fidgeted, cried, or made noise. It was exactly the mood I would have expected had we been at a funeral or memorial of the passing of a person deeply loved and respected. Instead of being at an occasion of sadness we were celebrating Sunday Mass. We were celebrating the greatest event of human existence. Heaven and earth were being connected as Jesus came down from heaven, becoming our life giving food, and dwelling within us. This is actually something that has been bugging me for some time. There seems to be a general lack of joy as we celebrate the Eucharist together. It is easy to understand why more and more people fall away from the Catholic Church, preferring one of the mega churches that concentrate on experience and emotion. People have a hard time putting their finger on the exact reason for it. They claim to like the music better or get more out of the sermon. Every reason I have heard always points back to one thing. Joy. Those mega churches fill people with a sense of Joy. They feel good going there. We were made to be happy and people will crawl through the desert on their hands and knees to find happiness. The joy these mega churches offer is real joy but it is a false joy. It is a happiness directed in. The music or good sermon makes us feel good about ourselves. 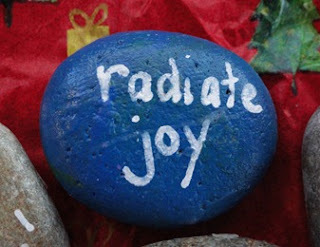 True joy is happiness that radiates outwards. Instead of being filled from the outside in real joy is like a spring that wells up from within us and bubbles outward. Church leadership struggles with ways to fill the pews. We look for the right combination of things to bring parishioners back. Homilies have changed through the years. It is rare to find a church that preaches about the pains of hell. We strive not to dive too deeply into what makes a moral life. In our rebellious nature no one wants to hear what is the right or wrong way to live. Even absolutes like X and Y equal male are subject to personal interpretation. The more we stand up for what it right and good the fewer people will show up to hear that message. No matter what we do or direction we take it has to be joy filled for it to have any chance to work. We need to let Jesus work from within, to bubble up and shine through us. Anything done with joy causes a glow about a person that makes people take notice. A joyful person is one others want to be around. A joyful parish is a parish people want to be part of. The Catholic Church offers the greatest thing available to mankind. We offer the body and blood, soul and divinity of Jesus Christ, our Lord and Savior. Looking in from the outside, who would be interested in receiving him when the communion lines look as if they are filled by the walking dead? Be joyful and joy filled in all that you are given, even your sufferings and trials. Even those are blessings from God who will use them to bring about a greater good. It is through joy and love that they will know we belong to the Lord. Parable of the sower and the seed.